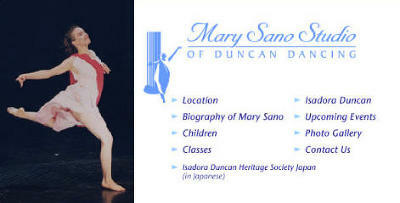 Caption Mary Sano Studio of Duncan Dancing 245 Fifth Street Suite 314 San Francisco California 94103 415-357-1817 The studio is located in the Tehama Loft building between Howard and Folsom St. SOMA near the Powell BART Station. Just a few blocks from the SONY Metreon Theatres. Parking available at the 5th and Mission Garage.